Hugo Pinto speaks at SXSW 2019! During March 8th to 17th, in Austin, Texas, will happen one of the greatests events of technology and information of the world, the SXSW 2019. 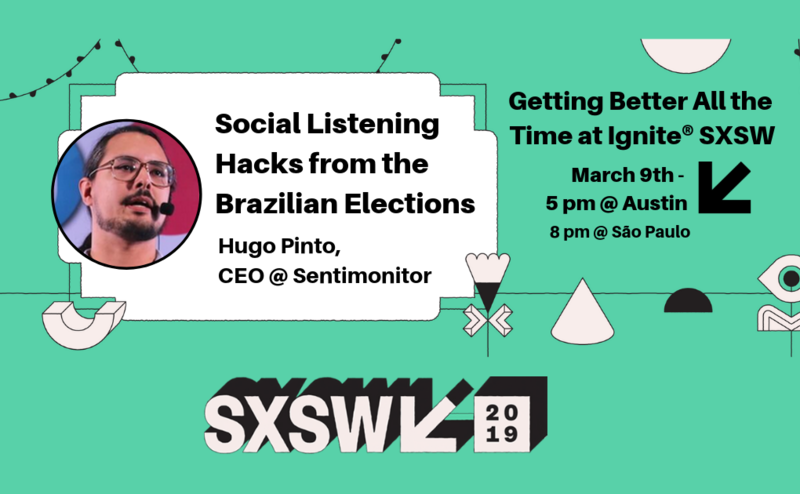 Particularly, on March 9 at 5PM-CST (20:00 at Brazil’s official time zone), Hugo Pinto, CEO from Sentimonitor, will be participating in one of the ignite, exposing the Social Listening Hacks from Brazilian elections. Besides Hugo Pinto, the pannel will count on the presence of speciallists of Blockchain, AI in healthcare, internet trends, with highlight for Michael Bodansky who will talk about Brexit via behavior psycology and Brian Solis, a huge name from the communication world. The ideia of ignite, it’s make literally what it means: bring innovative thoughts and actions to create a combustion of new ways of thinking the reality we live in. Want to chat about Social Listening Hacks, brand reputation and crises prevention? Call or send a WhatsApp to Hugo (+1 (669) 2934632 ). If you are from Brazil, send to +55 51 9335-6463 . This entry was posted in SXSW on March 8, 2019 by Sergio Pestana. Sentimonitor in the USA: SXSW Interactive and San Francisco! Sentimonitor will be in Austin/TX for South by Southwest Interactive, from March 6th to March 12th, and finish the week in San Francisco(from 12th to 16th). We are looking forward to meeting our US partners and clients(present and future;))! Our visit is part of the Brazilian Mission to SXSW, promoted by Apex-Brasil(Brazilian Agency for the Promotion of Foreign Trade) and ABStartups(Brazilian Startups Association). The mission includes speed dating in the Startup Village, a permanent exhibit at Casa Brasil(83 Rainey St, Austin,TX), and much more. If you are in San Francisco, and would like to meet, just drop us a note at hugo at sentimonitor DOT com. Time to finish packing and head to the airport! See you in Austin/San Francisco! This entry was posted in Uncategorized on March 5, 2014 by Hugo Pinto. The spread use of social media has changed the way customers search for and interact with products, services and brands, providing new opportunities for organizations and individuas to engage their public, know the opinions related to their products, monitor their competitors, and sell their services. It also created new threats, such as rapid-expanding, viral rumours, emergent influential detractors and lost opportunities that vanish if not quickly acted upon. To effectivelly work upon social media and be able to seize opportunities and counter threats, it is necessary to: (a) constantly capture what is being said about ones’ clients in the social channels, such as Twitter and Facebook (b) quickly discover from the deluge of data gathered, which particular posts, stories and people matter for our client’s business goals and (c) take the appropriate actions on the right time! 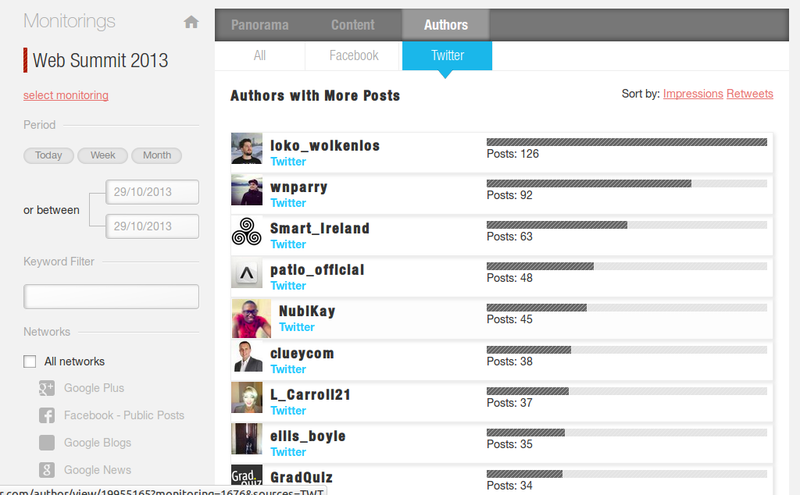 Sentimonitor is a social media intelligence tool that analyzes and ranks social media users and posts across dimensions such as activity, reach, engagement and popularity. This allows our clients to engage and pay close attention to the people and content that have the greatest potential to amplify their actions, making viable effective leverage of social channels with less time, money and personell. Additionally, Sentimonitor provides intuitive performance indicators about on the social presence of a brand and its competitors, providing intelligence for strategic and tatical planning. Founded in 2010 in Porto Alegre, Brazil, Sentimonitor has clients in South America and the European Union, in government, political campaigns, retail, media and entertainment. In addition to being an Alpha Startup at the Web Summit 2013(Dublin/Ireland), Sentimonitor was recognized as an innovative high-potential startup at events such as La Red Innova 2012 (São Paulo/Brazil) and Spin RedEmprendia 2012 (Madrid/Spain). Sentimonitor is supported by the top research and innovation agencies at regional and national levels, such as FINEP (Funding Authority for Studies and Projects), CNPq (National Council for Scientific and Technological Development), and FAPERGS (Foundation for Research Support of the State of Rio Grande do Sul). You may try Sentimonitor at http://www.sentimonitor.com. 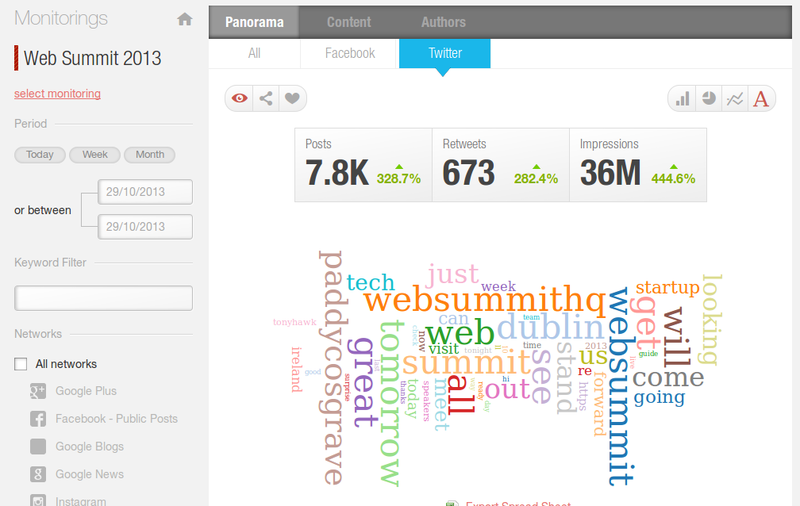 For the duration of the Web Summit, all users will be able to explore the monitoring of the Web Summit itself – with 47K+ messages and counting! This entry was posted in Uncategorized on October 30, 2013 by Hugo Pinto.